With the Cybermen set to return to our screens in David Tennant's first season as the Doctor, there's no shortage of Cyber-adventures doing the rounds on audio at the moment, very probably cashing in on the excitement. In addition to Big Finish's Cyberman series, BBC Audio has released the creatures' debut story The Tenth Planet and this eight-part Troughton serial. Like The Tenth Planet, The Invasion was previously released as part of the Cybermen tin in 2004 and, in common with that same story, it is also a very significant piece of Who history. For this serial sees (or rather hears, I suppose, since this is an audio release) the introduction of the United Nations Intelligence Taskforce, the paramilitary organisation that would become a mainstay of the series throughout the Jon Pertwee years and would reappear, intermittently, right up to the present day. This story is therefore the "pilot episode" of the UNIT era, if you will, a testing ground and a demonstration of the show's forthcoming change of emphasis. Director Douglas Camfield packs in the action, which includes gun battles aplenty as well as transportation in vehicles as diverse as helicopters, planes, a lorry and a canoe. Sadly, of course, the visual appeal of these aspects is lost on audio. In aural terms, the serial also seems to be a testing ground for sound effects used in a later UNIT tale, The Ambassadors of Death. Several special sounds and voice effects would be reused, or at least closely mimicked, in Ambassadors, including most notably the voice of the Cyber-planner, which sounds remarkably like the alien voices in the subsequent serial. In both cases, the voices were provided by Peter Halliday, who also plays International Electromatics' Security Chief Packer here. The voices of the Cybermen themselves aren't very threatening, though the sound of their hypnotic signal is as memorable as the monsters' famous march down the steps of St Paul's Cathedral. UNIT stories have always been contentious in terms of their dating. Are they set around the date of transmission (as stated in Mawdryn Undead) or a few years hence (as stated in Pyramids of Mars)? This story is no exception. Publicity material - including the synopsis on the back of the CD case - claims that the serial is set in 1975. This is never stated in the programme itself, but several story elements strongly suggest a near-future setting, including a computerised answering service, videophones and electric cars. While we are all now familiar with soulless automated call centres, videophones - though in use - are by no means widespread, and electric cars have yet to catch on even today, never mind back in 1975. All we know for sure is that The Invasion takes place four years after The Web of Fear, which itself occurs more than forty years after The Abominable Snowmen, which The Web of Fear states took place around 1935 (though this date is proposed by Anne Travers and confirmed by Victoria, rather than by Professor Travers himself, so it might not be reliable). I believe it is significant that International Electromatics is said to dominate the world's technology and that the company's director is in league with the Cybermen. I theorise that, rather than being set in the future, The Invasion is set on a version of Earth where certain technological advances occurred more rapidly than in our world, as an indirect result of the alliance between Vaughan (Kevin Stoney) and the Cybermen. Many serials in Patrick Troughton's final season of Doctor Who were elongated as a result of multiple scripts falling through during development. Again, this story is no exception. The Cybermen aren't revealed until halfway through and, as with The War Games, the plot is padded out with the aid of endless bickering between the bad guys, in this case Vaughan and Packer. Vaughan does provide plenty of Bond-style villainy, though, thanks to Stoney's suave yet sinister performance. Six episodes of this adventure are known to exist visually and have been issued on video, so what really makes this triple CD worth buying is the chance to hear the previously unreleased soundtracks to Episodes One and Four. 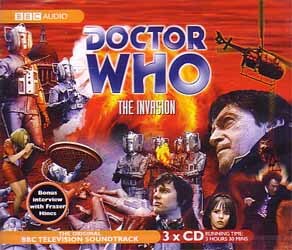 Also including a bonus interview with the narrator, Frazer Hines (Jamie), The Invasion may be over-long, but this complete soundtrack still makes a welcome addition to the range. What would be even more welcome is a DVD release, with and without the narration on the audio-only episodes.